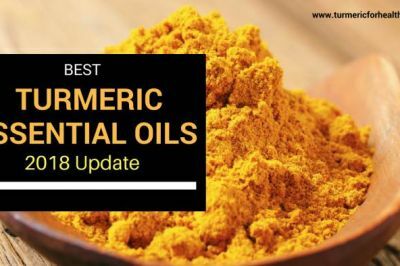 Lately there has been a lot of research on turmeric’s anti-cancer activity and we have presented most of this evidence in Turmeric for cancer. 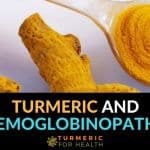 Apart from this turmeric also enhances the sensitivity and efficacy of conventional anti-cancer therapies. 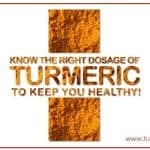 Curcumin, turmeric’s bioactive ingredient, is mostly responsible for the anti-cancer activity of the herb. Cancerous cells are varied in nature but their uncontrolled growth can be attributed to loss or modification of the systems that are involved in cell growth, proliferation and death. Many plant based compounds have been identified that act on these system that regulate cell growth and thereby prevent cancer from spreading and also cause death of cancer cells. Curcumin is one such compound. 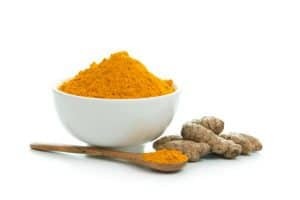 This article describes the various targets curcumin manipulates at cellular level to inhibit cancerous growth. What are the phases involved in cell cycle? Cell cycle is a series of sequential events that lead to development of new cells. Prior to these processes, the cells need to equip themselves with all the materials required for cell division. G1 phase: This is gap 1 phase where the cell ensures that all the material required for synthesizing DNA is present. S phase: This is the synthesis phase where DNA material is replicated. G2 phase: This is the gap 2 phase where the cell grows and all the materials required for cell division is accumulated. M phase: This involves mitosis where both cell material and DNA is divided to form two new daughter cells. G0 phase: Some cells enter this phase to rest permanently or semi-permanently whereas some cells skip this phase and enter G1 phase again. To ensure that these processes are running smoothly and sequentially, there are mechanisms known as cell cycle checkpoints. Each cell cannot progress till requirements of checkpoint have been met. It consists of a number of proteins that regulate the cycle and ensure that DNA replication and repair has been carried out. The cell cycle consists of various phases that occur sequentially and cyclically as the cell keeps dividing. Cell cycle checkpoints are a number of proteins that ensure that the process is running smoothly and all key processes have been carried out. As you see, the cell cycle is a very intricate process that is regulated by a good balance between proteins, biological molecules and cell signalling pathways. Here are a few of the targets that curcumin manipulates in order to control the cell cycle of cancerous cells. Both these proteins bind to each other and act in combination at the cell cycle checkpoints. They regulate progression of the cell into each phase. Common classes of cyclins include G1-phase cyclins, G1/S-phase cyclins, S-phase cyclins, and M-phase cyclins. These proteins are considered potential targets for anti-cancer medications. 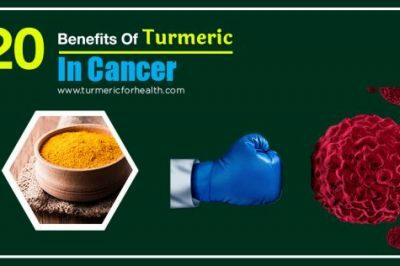 Curcumin acts specifically on both these proteins especially cyclin B and D. This helps in interrupting the cell cycle of cancer cells. As the name suggests these proteins inhibit the activity of cyclin and cyclin dependant kinases and negatively regulate the cell cycle. The group consists of proteins with the name p21, p27 and p57 and curcumin’s activity against the first two has been documented. It is the tumor suppressor protein and it can induce cell death or apoptosis. It can also arrest the cell cycle at G1/S point which makes it a therapeutic target for cancer treatment. These are cell division cycle protein families. One such family goes with the name Cdc25 and members of this family regulate the activity of cyclin dependant kinases. Few of the members of this family are called oncogenes- cancer causing genes. Bcl-2 family of proteins consists of members that regulate cell death or apoptosis. They can induce or prevent apoptosis. Bcl-2 and Bcl-XL prevent apoptosis and overall these proteins regulate life and death equation of the cell. These proteins regulate cell cycle and can also induce arrest of the cell in a particular phase or even cell death. These are vital cancer drug targets. Many of the chemicals produced during inflammation also play a role in tumor progression. Caspase family regulates apoptosis. 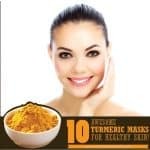 Inflammatory mediators like interleukin-6, cyclooxygenase-2 also control the tumor environment and curcumin by means of it anti-inflammatory properties acts against them. In case you are interested in the scientific research, here are the different types of cancerous cells that curcumin inhibits by arresting them at different phases of cell cycle. 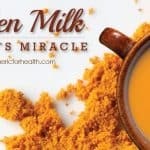 How does Turmeric kill cancer cells? Cell death or apoptosis is a highly regulated process. There are a number of biological molecules that induce apoptosis whereas some inhibit it. 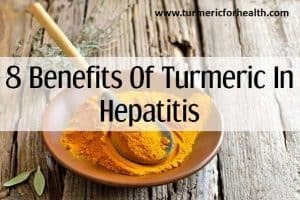 Curcumin acts via extrinsic pathways such as activation of inflammatory mediators (caspase) and interaction of proteins known as death receptors that are present on the cell surface. 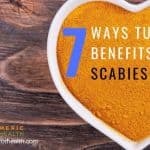 Additionally it acts intrinsically by affecting cell organelles like mitochondria, causing DNA damage and oxidative stress (imbalance between antioxidant and prooxidant agents) in the cell. Antioxidant & Prooxidant property: This helps in terminating cancer cells and protecting normal cells. Anti-inflammatory property: By virtue of this property, it interacts with various signalling pathways like Nuclear factor-kappa B pathway and JAK-STAT signalling to induce apoptosis in cancerous cells. Interestingly, depending on the conditions, curcumin also protects certain cells from apoptosis. 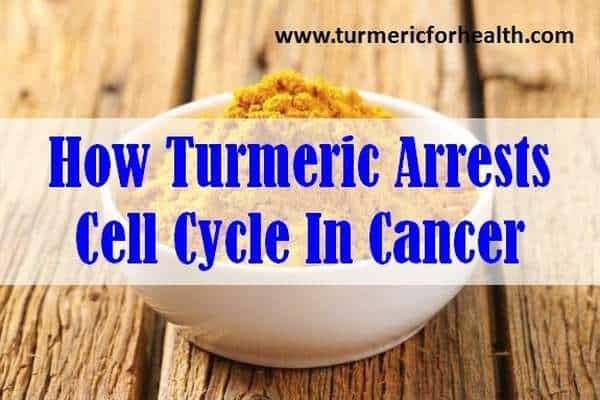 How does turmeric’s cell cycle arrest property benefit in cancer therapy? Cancer therapy is directed towards apoptosis of cancerous cells and apoptosis is a preferred way of cell death since it does not affect surrounding cells. Tumor cells evade apoptosis by increasing the activity of anti-apoptopic proteins and decreasing the activity of pro-apoptopic proteins. It also modulates proteins regulating cell cycle, some of which I have mentioned earlier, and thereby increase survival of cell. 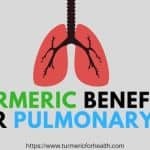 Curcumin acts on the very proteins that cancerous cells use for increasing their survival and terminate the growth of cancer cells, increases the sensitivity of cancer cells and protecting normal cells. 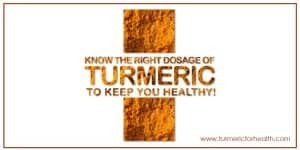 When taking it as a prophylactic measure, it is wise to include turmeric in your food. 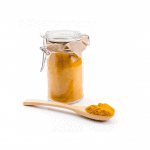 When taking turmeric in the raw form the recommended dosage is 1.5-3g of cut root or 1-3g of dried powdered root. 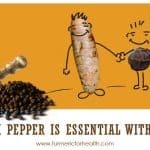 Taking black pepper with it increases the absorption of curcumin in the body. 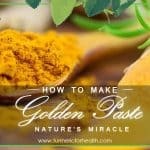 A great way of taking turmeric daily is The Golden Paste. Start with 1/4-1/2 tsp daily and if you observe no side effects increase by 1/4 tsp every week. The recommended dose is 1-2 tsp 2-3 times a day. 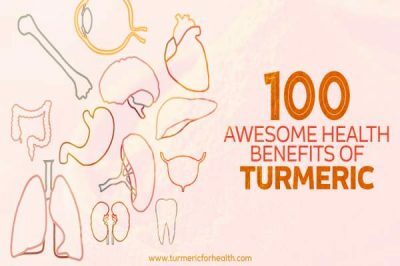 Turmeric in food is absolutely healthy and safe. 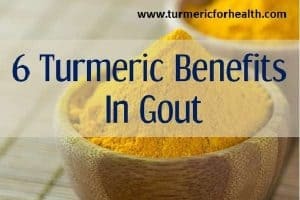 If you are taking turmeric for the first time you might face slight gastrointestinal discomfort for a few days. 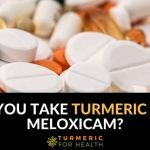 Avoid taking turmeric supplements during pregnancy and lactation. 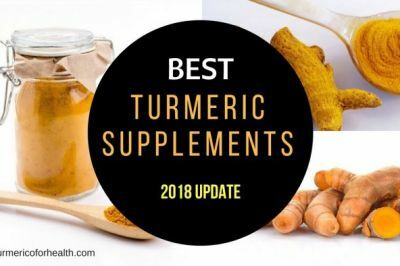 Discontinue turmeric supplements 15 days prior to surgery to prevent risk of bleeding. 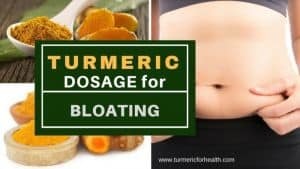 Turmeric supplements may interact with medications used to reduce stomach acid, blood thinning and diabetes medications. 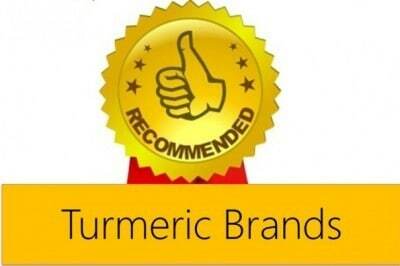 Turmeric and curcumin are well proven by research as anti-cancer agents. However the science behind this property of turmeric is multifactorial. One of the most interesting ways by which it acts is by interfering in the cell growth or development of cancer cells and by regulating the very mechanisms of cell survival that cancerous cells have manipulated for their uncontrolled growth. However this activity is only directed towards cancer cells and normal cells are protected from side effects. 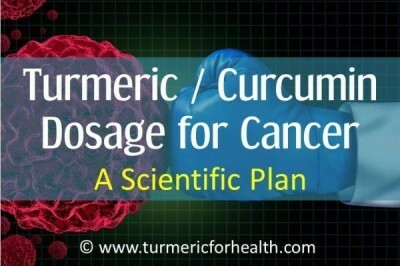 This makes turmeric an excellent candidate for cancer therapy.